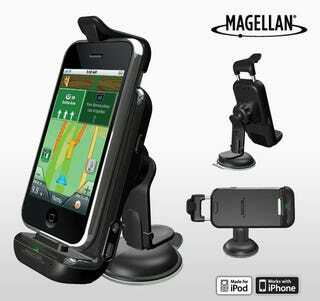 It's not the first iPhone GPS car kit, but Magellan's list of features might make this one of the better ones, and it doesn't even require you to use Magellan's own GPS app. It's got a built-in GPS receiver, so it can work with your iPod Touch, as well as a charging port (obviously), Bluetooth for hands-free calling, audio-out for car stereo support, a built-in speaker and a noise-canceling speakerphone. And it's designed to dock with your phone even if you've got a case on it.